The restoration of a popular downtown Newberg coffee shop is finally complete: Chapters now has a restored original storefront. This renowned attraction for coffee drinkers and book readers alike has an interesting history, one that starts with one of George Fox University’s (GFU) very own professors. What is now Chapters was constructed on 701 E. First St. in 1891 to serve as the Morris, Miles & Company General Store and was known to be one of the original and oldest commercial buildings currently existing in historic downtown Newberg. Over the summer, the Newberg Downtown Coalition won a grant to cover the remaining $97,000 of the original $163,000 project, so the facade could be restored to its most original state. The money came from the Main Street Revitalization Grant, a new Oregon state funding program aimed at revitalizing communities’ downtown historic thoroughfares. Thanks to the grant, the smooth, orange stucco-covered concrete with large glass storefront windows below a horizontal metal awning was removed to reveal the old brick beneath it. The large vertical windows and double set of doors were among the most important original features replaced. Polly Peterson, GFU graduate and assistant professor of English, conceived the idea of Chapters in 2001 with her husband Brent, and originally had the storefront across the street in what is now a dentist’s office. 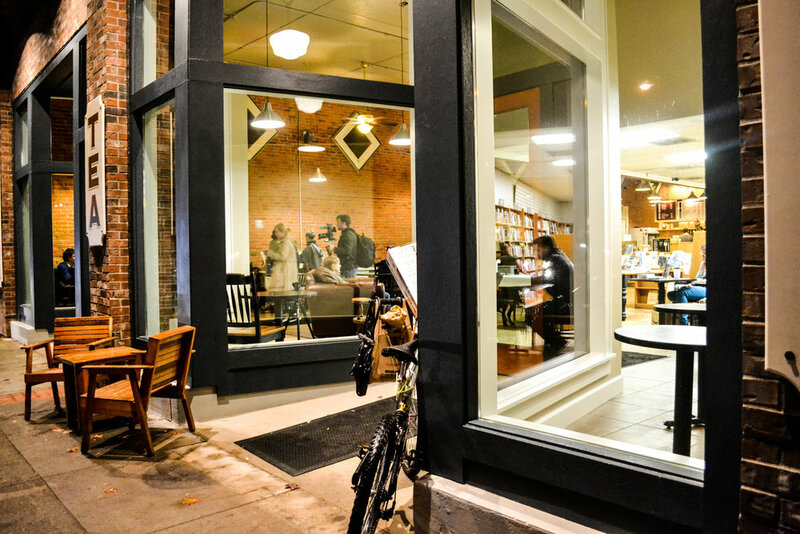 Speaking about the time they noticed the condition of downtown Newberg in 2001, Peterson reflects, “This was a university town without a bookstore. Are you kidding me? Books without coffee?” They had to change that. “We had bought the dentist’s office across the street with plans to have a small storefront that bought rare books from people and then, just before it was becoming popular, turned around and sold them on Amazon,” Peterson said. A few months after they had started there, they decided to move right across the street and buy the building that was Higher Ground, a Christian bookstore on one half and a candy shop on the other. Higher Ground was going out of business, and the Petersons had a new vision for the space. The Chapters many locals know today started to take shape. Originally, books had been laid out on several tables throughout the shop, many of which were from Peterson’s own personal library. While simultaneously marketing books and coffee, customers would come in with intent to buy a specific book, and end up purchasing some coffee as well. “We wanted to imitate the business model of Powell’s [the large bookstores in Portland] and we wanted to have the mixture of the old books, the new books, and with coffee,” Peterson said. The business continued to thrive, but the Petersons found it difficult to maintain the business so they ended up selling Chapters to their book manager, Maureen Rogers, and her husband Bill, in 2005. “At the same time I started teaching here [GFU] I had to make a decision: Did I want to manage the bookstore or did I want to work here, and eventually [I] decided to work here,” Peterson said. To this day, Chapters sells new and used books ranging from fiction, children and youth, travel, religion, self-help, cooking, and sustainability; they also serve Stumptown and Caravan coffee. For those interested in selling books, Chapters will buy most new or used books for an exchange of in-store credit.